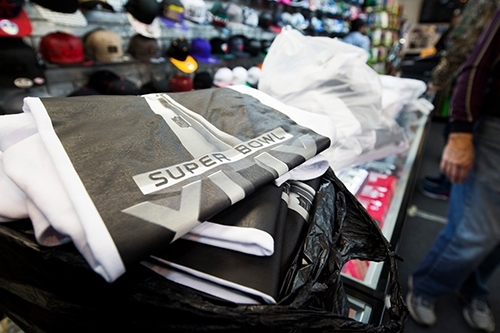 Enforcement agents in the US have seized more than 260,000 counterfeit sports-related items in a year-long crackdown. Immigration and Customs Enforcement (ICE) and Homeland Security Investigations (HSI) said the haul - worth an estimated $20m - included fake jerseys, hats, cell-phone accessories and thousands of other bogus items that were being prepared for sale to unsuspecting consumers. "Criminal elements use major sporting events like the Super Bowl as an opportunity to sell substandard and counterfeit goods to the American public," commenting acting ICE director Thomas Homan, who took the role after President Trump fired his predecessor Daniel Ragsdale earlier this week. "ICE special agents are committed to collaborating with industry and law-enforcement agencies to crackdown on counterfeiting that significantly impacts local economies and funnels money into organizations involved in additional illicit activities."